On May 25, 1921 the Irish Republican Army launched its largest and most audacious operation of the War of Independence when it attacked the Custom House in Dublin, the heart of the British administration in Ireland. In addition to the book by Liz Gillis on the burning, published by Kilmainham Tales Teo., we have also produced a badge based on the design shown here to commemorate the attack and all the people involved. 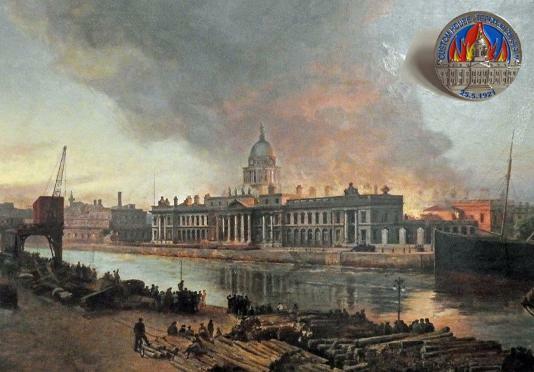 The central image on the badge is the Custom House itself as seen from the Liffey. This, in fact, is the rere of the building, but is the side most familiar to Dubliners. 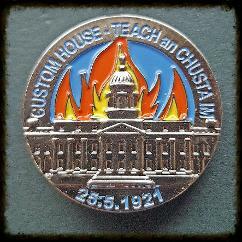 The badge is circular, 25mm wide (chosen to represent the date - 25 May 2021), and displays in blue enamel the words "Custom House - Teach an Chustaim" and the date of the attack "25.5.1921". The badge is only available from Kilmainham Tales Teo. Rising from the Custom House are three distinct flames, each represent one of the three bodies of people involved - The IRA, the Crown Forces and the Civilians caught up in the attack. 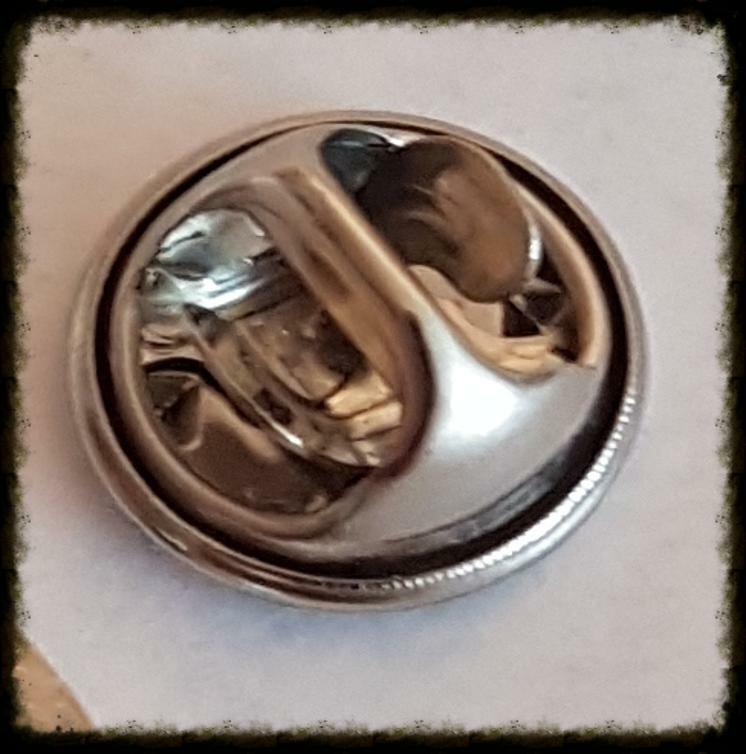 The badge is in hard enamel, and has a butterfly clutch on the back, making it suitable for use on coat lapels, as a tie pin or a scarf clutch. 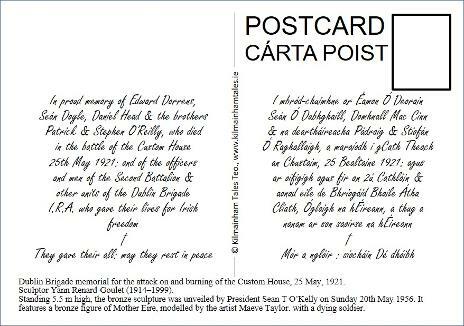 Each badge comes mounted on a special postcard, showing the burning of the Custom House, and is autographed by the designer, Mícheál Ó Doibhilín. It is the first in a proposed set of five to mark one of the most significant events on the history of the Irish War of Independence. A new badge was produced in time for the 2018 'Burning of the Custom House' Conference, incorporating the magnificent statue commissioned by the Dublin Brigade to commemorate the attack on the Custom House. 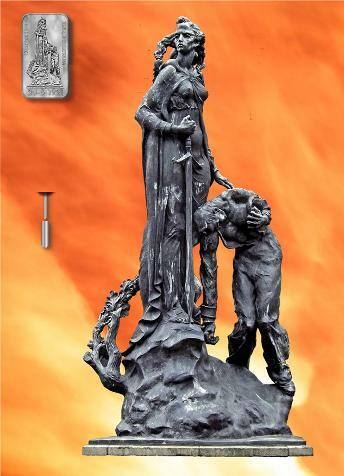 Designed by Yann Renard-Goulet, the bronze statue - which depicts Mother Éire with a dying soldier - stands 5.5m tall, and was unveiled by President Sean T. O'Kelly on Sunday, May 20th, 1956. Around the plinth is an inscription commemorating the five members of the Second Battalion who were killed in the attack. The Badge, with a stick-pin and clutch, is 25mm high by 15mm wide, and carries the inscription "Custom House - Teach an Chustaim - 25 - 5 - 1921. Each is mounted on a specially designed postcard which shows the statue on a background of flames, while the reverse has details of the statue and a transcript of the inscription. This beautiful limited edition pin badge and card - the second in a proposed set of five - was again designed by artist Mícheál Ó Doibhilín to mark this most significant event of the Irish War of Independence, and each postcard is individually autographed by him. This specially designed badge is only available from Kilmainham Tales Teo. Each badge - complete with souvenir postcard - costs just €5 +p&p.